On 13 August 2013, the International Livestock Research Institute (ILRI) and BAIF Development Research Foundation hosted a small ruminant policy meeting at the Park Hotel in New Delhi, India. This activity was part of the imGoats project. Over 50 participants were present, including representatives from central and state government, agricultural research institutes, development organizations and the private sector. There were sessions on innovations and stakeholder linkages, market linkages, and service delivery and community-led extension. Each session had two presentations which were followed by lively debates from a panel of experts and the participants. In India, two sectors of small ruminant production co-exist: smallholders in semi-arid and arid regions and commercial farmers. 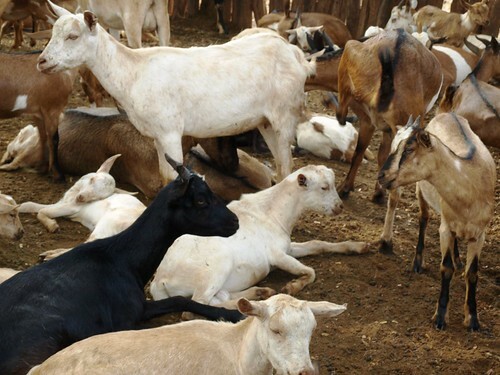 The increased demand for goat and sheep meat offers an opportunity for both sectors to grow. There is also a good opportunity to maximize the use of by-products that are currently unused for the most part. Because of the diversity of these two sectors, their respective needs with regard to training and services are different, as is the case for their policy needs. Of importance is the organization of smallholder producers into self-help groups that will eventually evolve into cooperatives. Other institutional models can be explored to stimulate linkages with the private sector. Important measures of success include widespread adoption by smallholders of improved animal health, breeding and feeding practices, as well as improved interaction among value chain actors to enhance smallholder market participation. For the private sector, compliance with internationally recognized certification standards, such as ISO International Standards, is important to ensure high-value market participation in India and access to export markets. Tags: animal production, goats, imgoats, policy, sheep, small ruminants. Bookmark the permalink.